If I said the word metatarsal, most non-scientists among you, would know exactly where this bone is in the human body – thanks to David Beckham. Beckham‘s metatarsal became a talking point and a hugely important issue to England football fans when he fractured it in the build-up to the 2002 World Cup. He’s not the only Premiership footballer to have damaged this bone. Others include Wayne Rooney, Steven Gerrard, Gary Neville, Roy Keane, Ashley Cole, Ledley King, David Nugent and Michael Owen. But the beautiful game aside (you didn’t seriously think I’d blog for that long on footie, did you?! ), scientists have discovered a complete metatarsal that has got the whole palaeontology world very excited. The bone belongs to Australopithecus afarensis – an early hominin – that lived about 3.2 million years ago in the area where the village of Hadar in Ethiopia is. The bone is from the member of the same fossil species that was discovered in 1974 called Lucy. 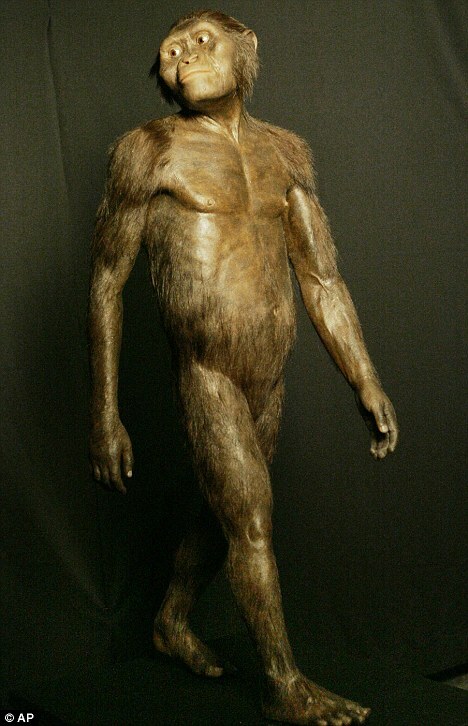 A 3-D model of the 3.2 million-year-old hominid known as Lucy, whose partial skeleton was discovered in 1974. Lucy was a hominin fossil that was discovered 40 per cent complete. She had a skull capacity akin to that of apes and is believed to have walked bipedal akin to that of humans; but she had no metatarsal. Without the evidence provided by these small foot bones, it’s difficult to tell for sure whether Lucy was fully adapted to a life on two legs, or whether she was still a flat-footed little ape. The arches in our feet are a key adaptation to walking and running. They act as both a shock absorber and a lever to help us move our weight forward onto the balls of our feet. The Northerner who is terribly flat-footed doesn’t cope well with lots of walking. Arches are absent in today’s apes, which have more flexibility in the foot to provide better grip while moving around trees. But scientist don’t know whether A.afarensis had arches in their feet. 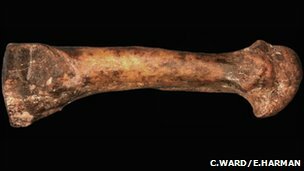 The new fossil bone is the first complete fourth metatarsal known to have belonged to Lucy’s species, according to the team led by professor Carol Ward at the University of Missouri in Columbia, USA. The authors’ findings have been published in the journal Science. Professor Ward said: “It’s the key element that differs between apes and humans. “The development of arched feet was a fundamental shift toward the human condition, because it meant giving up the ability to use the big toe for grasping branches, signalling that our ancestors had finally abandoned life in the trees in favour of life on the ground. “People today with “flat feet” who lack arches have a host of joint problems throughout their skeletons. 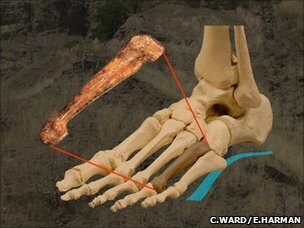 Understanding that the arch appeared very early in our evolution shows that the unique structure of our feet is fundamental to human locomotion. The new fossil provides strong evidence that Lucy could walk the walk of a modern human. A small step for an ape-man, but a giant leap for mankind. ← Get your dirty paws off me…..